According to the seller, the missive is “deeply revealing” of Casement’s “complex and chivalrous character. A LETTER WRITTEN by Irish nationalist and human rights campaigner Roger Casement to a police inspector just days after being committed to trial for treason in London is to be sold at auction next month. The signed and dated note to Superintendent Joseph Sandercock is expected to fetch between £8,000 and £12,000. Composed on 17 May 1916 from Brixton Prison, the letter quotes Robert Louis Stevenson and compliments the inspector for his “wholly chivalrous and high minded manner”. 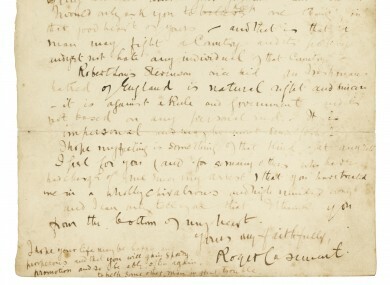 It was written to Sandercock – an inspector in the Metropolitan Police’s CID with a particular responsibility for counter-espionage - three months before the British diplomat turned Irish volunteer was put to death for treason – but he seemed to hold no anger towards his imprisoner and executor. “From the time you took me in custody at Euston on Easter Sunday and again took me to the Tower on Easter Tuesday you showed me the best side of an Englishman’s character – his native good heart,” Casement wrote. Sotheby’s described the letter as “somewhat faded and spotted” but “professionally conserved”. The sale is due to take place at the London auction house on 10 December as part of a greater English Literature, History, Children’s Books and Illustrations auction. Casement, a former British consul, was held in high regard in the early 20th century for exposing atrocities in the rubber industry in Brazil, as well as other human rights abuses in the Congo and Peru. He was even knighted for his exploits in South America and Africa. However, he soon turned radically against his government because of the Home Rule crisis in 1913. He became a leading member of the Irish volunteers and travelled to Germany after the outbreak of World War I to garner German support for the Irish cause. On the way back with armaments, he was intercepted and arrested. He spent a few months in prison and was hanged on 3 August 1916, aged 51. In 1965, Casement’s body was repatriated to Ireland. During the five days while he lay in state at Arbour Hill, an estimated 500,000 people filed past his coffin. He was buried with full military honours in Glasnevin Cemetery in Dublin. Email “Roger Casement letter to prison inspector to sell for up to £12k”. Feedback on “Roger Casement letter to prison inspector to sell for up to £12k”.